A Cappella Double Feature - The Dins and Kroks Hit L.A.! PLEASE NOTE: THIS PAGE IS FOR LAST YEAR'S CONCERT. IF YOU ARE LOOKING TO BUY TICKETS FOR THE JANUARY, 2018 EVENT, PLEASE CLICK HERE. Join us Saturday, January 14, 2017 for an amazing opportunity as we present two of Harvard’s most prestigious a cappella groups in concert, right here in Los Angeles. 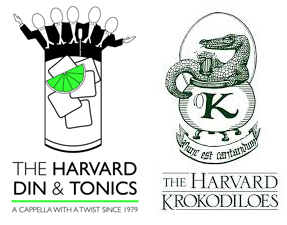 The Din & Tonics and the Krokodiloes will be visiting Los Angeles on their Wintersession tours, and the Club is sponsoring a concert featuring both groups. Tickets are $15 for members, $25 for nonmembers. With annual membership in the Club just $25 for recent graduates, and as low as $45 a year for everyone else (with purchase of a three year membership), why not join now and take advantage of the savings?